You are here: Home / misc / Why are custom frames so expensive? When you look at a small frame that is readily available at places like Big W, Kmart, or Ikea, you may find something for around $40. However, if you go into any frame shop with your photograph, you may be quoted around $100 for a basic frame, with options here and there adding another $30-50 to your cost! So why is there such a big price difference? Why don’t Family Photographers use cheaper versions? Let’s look at each part of the frame and see how it’s made. Our framer hand cuts the wood from a long piece into the exact lengths needed. Any dents or scratches in the source wood is avoided. The joins are perfectly aligned and everything is perfectly smooth. Most retail frames will have dents and scratches either from the original material or due to the shipping process. The joins on a mass produced frame may be smooth or not depending on the production run. Sometimes you’ll get some really good ones. Mostly they will have gaps and excess glue forced out the front. The wood itself will probably be a lighter soft wood if you’re lucky, or more likely a cheap chipboard. Since the joins are held together by staples and glue the whole frame will likely loosen over time and become rattly. That is why there are clearance sales all the time, to get rid of defective frames left after all the better ones have been picked off! Retail frames use really thin glass to cut on costs. It is also not cleaned and may have chemical streaks on it. Our framer tells us the most common complaint he has is customers getting glass replaced on cheap retail frames. They had cracked simply from being cleaned. This may not work as the frame cannot hold anything but thin sheets of glass. We use good quality glass that is firstly cleaned before installed. You don’t have to clean it before hanging. You also have the option of using non reflective glass or perspex depending on your needs. Retail frames often don’t come with mats at all. We think that to display your photographs without an appropriately mat is like going to a high class restaurant and being served with plastic cutlery. It is important for anything photographic to be acid free, so that your art doesn’t yellow and fade with age. Retail frames that have mats use cheap materials sourced from China which may claim to be acid free. This may be true at the time of production but they are not buffered so they become acidic with age. They are chosen only because they cost $1 or less. Our framer uses archival grade acid free mats – their cost price is over $12 each! They are buffered and lignin free, so your artwork is guaranteed for many years. Each mat is custom cut to complement your artwork perfectly. The most common mat colors are white and black, but did you know you can choose from a range of hundreds of colors? Even when talking just about whites, we have over a dozen shades and textures in our range. Depending on your photograph and paper type, the right mat will make a huge difference to how the artwork feels. In a retail frame your photo is wedged in place between the glass and the backing board. This is a cheap piece of particle board that sheds dust and particles as it rattles around. Getting your frame dust free while installing the photograph becomes a nightmare, not to mention the whole back of your print is touching something not acid free. In our custom frames, your photograph is first glued to a photo grade acid free foam back in a vacuum press. This means there will be no bubbles, and your print will never curl within the frame. Then the mat is glued to the front of the photograph, again using the vacuum press. It is this complete construct that gets sealed into the frame. Nothing will ever move and there will never be any dust in your frame. Retail frames are bound by the most common sizes. They have mats that work for sizes up to about A4 but I have not seen any that show off larger pieces of art in a flattering way. Mats are generally unbalanced, or too narrow for photographic art. Custom frames use custom mats that are perfectly fitted to your photograph. 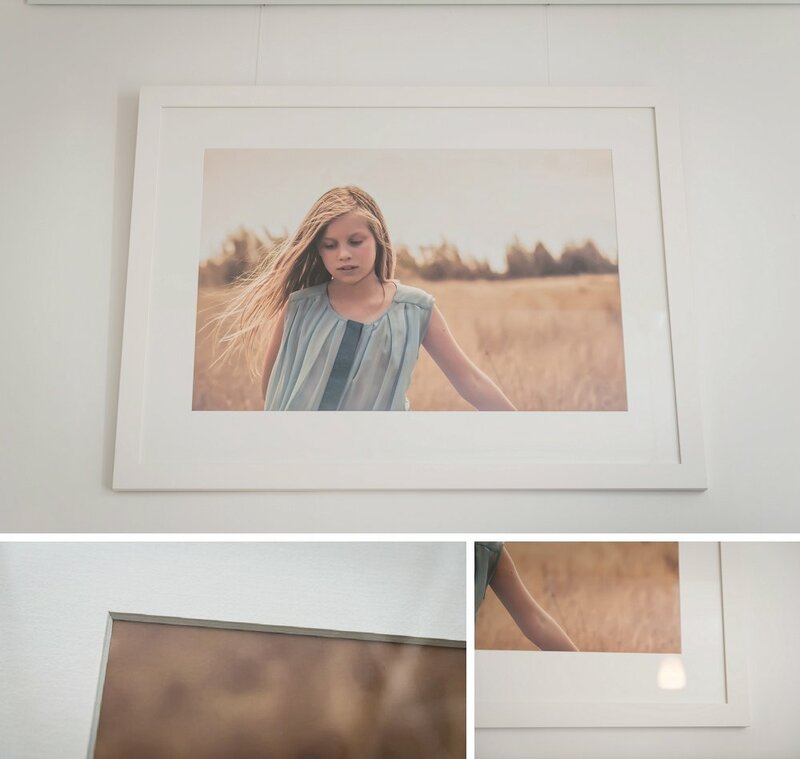 You can even have multiple openings to show a series of photographs in the same frame. You can also size frames so they will hang as a matched set in your home. Choosing frames isn’t as simple as it sounds. When you are making small prints for yourself, there are many options out there, and many of them are good. Just keep the above factors in mind when choosing a frame. When you get enlargements made by us, it is best to let us frame it or go to your local professional framer so that it can be shown off in the best way. 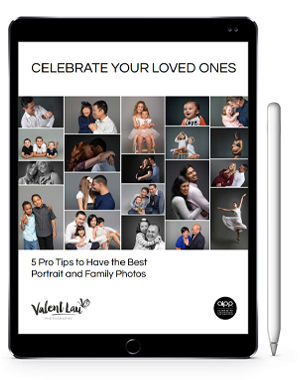 Valent Lau Photography provides Custom Portrait Photography and is based in South Coogee in Sydney’s Eastern Suburbs. All art is produced using high quality materials that will stay in top condition for many many years. Contact us now and take your first step towards creating some beautiful heirlooms.